The recently launched Samsung Galaxy S5 is the company’s latest flagship phone. The phone has a 5.1 Full HD display and its running on the Android 4.4.2 KitKat OS. Just like any other Samsung phone it comes with Touchwiz UI on top of android. And now coming to the point the Samsung Galaxy S5 SM-G900F the LTE variant which is powered by a Qualcomm Snapdragon processor just got Rooted. 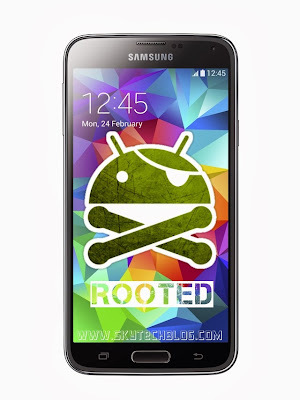 Chainfire a XDA developers member managed to root his device and gain root access successfully. This guide is specifically for the Qualcomm Snapdragon powered variant and not for the Exynos Octa core version which is just launched in India. NOTE: Sometimes the device does not boot into recovery mode and root your device. Just do the entire procedure again if this happens. If it still will not install root and such, make sure that in Odin “Auto Reboot” is not checked. Then after flashing, pull the battery, and boot with VolUp+Home+Power button to boot into recovery manually. This will start the install process.